It’s been very cold lately, warming up somewhat today, but this cold weather usually prompts me to go back to some photo shoots from warmer times of year. These barns, just down the road from Hale Farm and Village were shot with a Lensbaby on a shoot with one of my photo buddies! 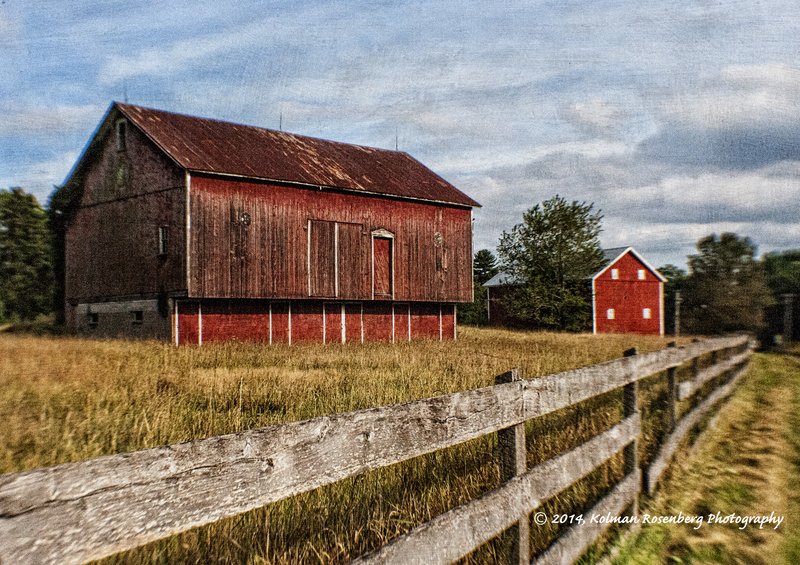 It was a nice warm late summer day and these two barns provided nice splashs of red in this rural landscape scene. This second photo, also shot late in the summer with my same friend, was taken on a cloudy, rainy day. As we drove down a rural road, we came upon this scene in a very light mist or drizzle. 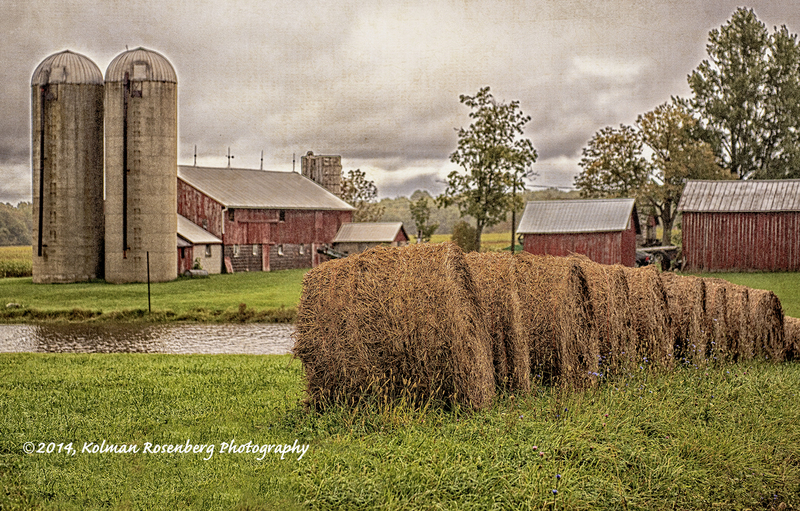 I stopped the car along the side of the road, grabbed my camera and walked down the road toward the rolled hay in order to get the perspective that I wanted. By the time I had walked maybe 50 feet, the rain had increased and it was coming down fairly hard! I quickly took a few shots and headed back to the car! Fortunately my camera is sealed pretty well for precipitation and all I had to do was wipe it off with a microfiber towel I always carry with me for such occasions. Both shots were edited in Lightroom and Photoshop, and Nik and Perfect Photo Suite 8 plug-ins were used to bring out detail in the sky and add additional effects and texture. This entry was posted in Uncategorized and tagged barn, Farm, Hale, hale farm, hay, Lightroom, Nik, Perfect Photo Suite, photoshop, red, rural. Bookmark the permalink.